World War II battle plan with Japanese annotations relating to the December 1941 Invasion of the Philippines. ィフッリピン諸島 / Philippine Islands / Firipin shotō. A remarkable discovery, this is an original 1941 World War II (WWII) Japanese battle plan, with original manuscript annotations, relating to the December 1941 invasion of the Philippines. 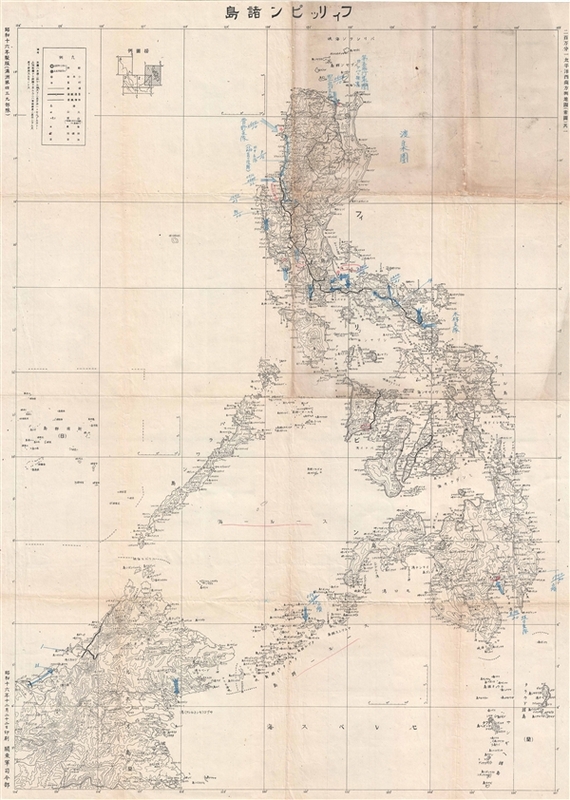 The map describes the strategy for capturing the Philippine Islands as devised by Lieutenant General Masaharu Homma. The strategy consisted of several landings, identified here with blue arrows, at Vigan, Aparri, Legaspi, Davao, and Jolo Island, supported by bombings of important airfields and transportation hubs, identified by little blue drawings of bombs. Most of the action focused on Luzon and control of the major rail lines extending outward from the American base in Manila. Ultimately the strategy was successful. The Japanese defeated the Allied forces, shipping many prisoners to mines and work camps in Japan, and seizing full full of the Philippines. The Japanese retained control of the Philippines until 1944. Like most Japanese aeronautical and maritime maps from the World War II Period, this map is derived from British and American charts. It was updated and revised for Japanese use and published for the Manchuria Army Unit 439 in December of 1941. Topography is presented using contour lines and all text is in Japanese. Good. Backed on archival tissue with some repairs and reinforcements and fold intersections. Recto exhibits some soiling visible in photos. Original annotations in blue and red pencil.